The universe is paradoxical, built on particles of matter that are also waves of energy. Quantum is similarly created from substance and transience, bodies and technologies, form and imagination entwined. Quantum commenced with support from Dr Alan Blackwell at Cambridge University Computer Laboratory, a multi-generational community dance group generating rule-based performance in collaboration with software architect Dr Sam Aaron for the Cambridge Science Festival, March 2013. TURNING WORLDS’ performers went on to work with new compositions by students on the MSC Music For Media course at the University of Hertfordshire towards a public dance/audio-visual performance at the Weston Auditorium, Hatfield, May 2013. Further evolved with Richard Hoadley’s innovations with the kinnect technology and composition augmenting the emerging sound score, the work went on perform at the Colchester Sensations Festival 28th September, Goldsmiths College, 19th October, The Ruskin Gallery, Cambridge 27th October 2013. 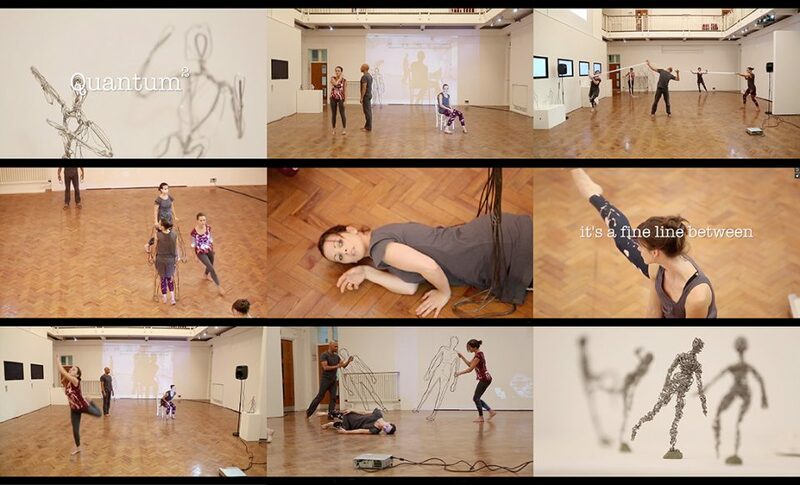 In 2014 Parts of Quantum were presented at the Live Algorithms for Music Symposium as part of the Artificial Intelligence and Simulation of Behaviour Convention April 1st-4th before traveling to the Museu D’Art Contemporani de Barcelona on 7th June and the Liverpool Hope University October 20th. Supported by Arts Council England.